Australia is certainly one of the few (Poland is another) countries that escaped a major upheaval in 2008. 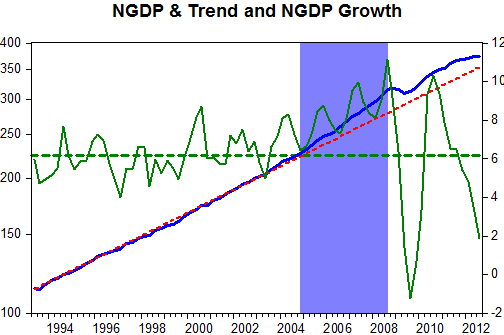 The chart shows that from late 2004, NGDP growth began to trend up after many years of fluctuating around a 6.2% average level. As luck would have it, the crisis caught Australia in a ‘favorable’ moment. NGDP fell strongly but bounced back quickly and forcefully. Although NGDP is still above trend, it is converging to trend from above. 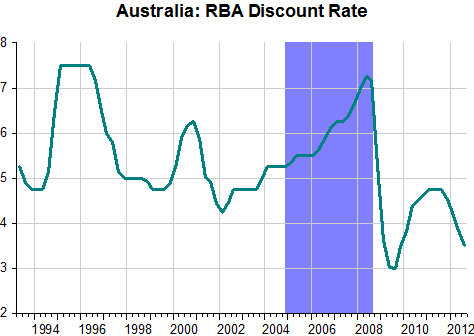 Hopefully, the RBA will stabilize NGDP growth as soon as it gets back to the trend level. The next chart shows that interest rates are certainly not a good indicator of the stance of monetary policy. In 2004-08, although the RBA was raising rates NGDP climbed above trend indicating that monetary policy was still ‘loose’. No mystery then that house prices did not tumble in Australia as they did in the US. You put a very nasty idea in my head ha ha ha, just kidding. Very interesting post, I find Australia interesting because of the idea that they follow Frankels PEP “rule” as mr.Christensen was writing and you illustrated in one occasion. NGDP bounces around with the terms of trade in a resource based economy like Australia where the central bank targets the CPI. It would not be credible or sensible to target a growth rate, or path, for the GDP deflator or for NGDP in such an economy, at least in periods where the TOT are volatile. The monetary authority should instead seek to anchor expectations for some nominal variable that is more aligned to the real economy. Like CPI or non-resources nominal GDP or a non-resources GDP deflator. Yes, the nominal exchange rate fell sharply and cpi remained anchored. So the domestic currency value of tradables rose. I gotta go read frankel …..
Marcus do you have any posts on the 1973-75 recession? ok I found a post with most of the information I need, but I’m still not sure why unemployment rose so much in latter half of the 70’s given strong AD growth. Thanks for the post. Marcus, you’re suggesting the RBA should have clamped down on the 2004-2008 commodity price-driven boom in NGDP. Perhaps, but it is now bringing NGDP back to the old trend line while commodity prices are still close to record highs. Is that very prudent, given that lower minerals prices may yet arrive? It will take super-stimulatory policy to maintain 6% NGDP growth if and when that happens. Rajat, remember that in 1997-00 there was a big commodity crash following the Asia crisis. Nevertheless, Australian NGDP was kept close to trend. Like JM, I don’t think NGDP (or Frankel’s product price target) is the ideal target for Australia, given how volatile commodity prices are. Most monetary theory says you want to target the sticky prices. Nominal wages (which Scott Sumner considers the ideal target: http://www.themoneyillusion.com/?p=16264) sped up a bit in the early 2000s, but were pretty stable after 2004 when NGDP was accelerating.